Eye bags are caused by thinning of the dermis, which contains the structural elements of the skin. 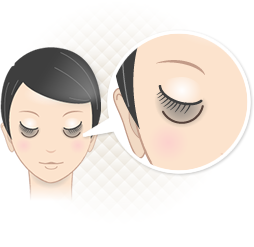 On the other hand, shadows are caused by increase in the size of the fat-pad lying below the lower eyelids. Both under eye bags and shadows make you look old. Theory Clinic helps you find a fundamental solution to your under-eye skin problems. 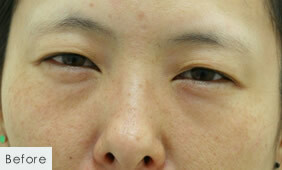 The size of the fat-pad below the lower eyelids increases with age and creates bags under the eyes. The bigger are the eye bags, the darker are the shadows. Due to aging, the orbital fat pad moves down and inflates the under-eye skin, thereby, creating uneven skin surface and dark shadows. The indented under-eye skin makes the whole face look old. Skin pigmentation causes brownish shadows under the eyes. If you pull the skin, the shadows lighten. In many cases, the same pigmentation occurs on the upper eyelids as well, causing shadows all around the eyes. Melanin pigment is produced in the deeper parts of the skin. Flecks are formed when melanin deposits under the skin. Brown eye bags are formed by the deposition of melanin in the under-eye area.The purpose of this treatment is to increase the elimination of melanin deposits and to prevent the formation of more deposits. It is also effective for eliminating under-eye spots. Click the box of your eye bag type to find the best treatment method. Front-line treatment technology enables the removal of the excess fat pad under the eyes without any swelling and downtime. By using a high frequency wave surgical laser, the treatment is completed in an hour. There is no bleeding and no residual scars. To improve brown eye bags caused by melanin deposits, treatments such as LimeLight and Laser Toning along with daily intake of vitamin C are recommended.